1. 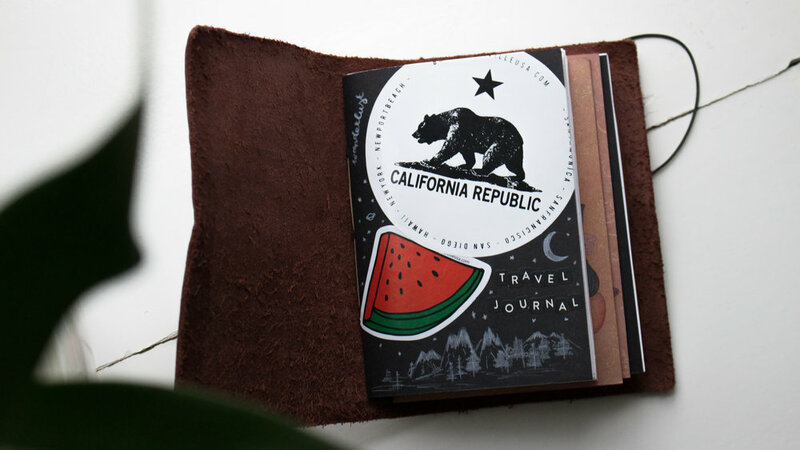 Travel notebook - I have this leather wrapped notebook (which I actually made myself) that I always bring with me on my travels. This way I can document moments or places that I want to remember, using my Windsor&Newton travel watercolour set, a micron pen and some washi tape. It is a great way to stay creative on the road without putting pressure on yourself to make it "perfect". 2. Scrapbook - This scrapbook I also use for my travels. Instead of bringing it though, I print out my favorite pictures from the trip when I get home and decorate the pages nicely. It has almost become sort of an index of all the trips I've taken. You could also scrapbook other things; your children, your high school experience or an especially important friendship. The one I use is a really cheap lined notebook, with pages so thin that I have to glue every second one together so the ink doesn't bleed through. 3. Art journal - I recently started an art journal, using this Moleskine sketchbook. It is not for everyone, of course, but I find it very soothing to create and play around with different mediums and materials. Any notebook will do really. I have often found myself glueing every second page together so the ink or watercolour paints wouldn't seep through to the other side. I also did a Youtube video on this. 4. Sketchbook - I know this sounds very similar to the art journal, but they are not quite the same. A sketchbook is, in my eyes, more of an instrument for practise. You can bring a sketchbook along with you and jot down ideas or practise drawing something specific, but they are not for masterpieces. You might accidentally create one, but not being afraid to create "bad" art is one of the first steps of getting better at being an artist. You need at least one place where you allow yourself to make mistakes and don't feel obligated to deliver a perfect, finished or even good piece. I use this Moleskine notebook as my current sketchbook. 5. Diary - okay, I know what you're thinking: "Writing a diary is only for 12 year-olds and high school girls in 90's movies." Well you are very wrong. 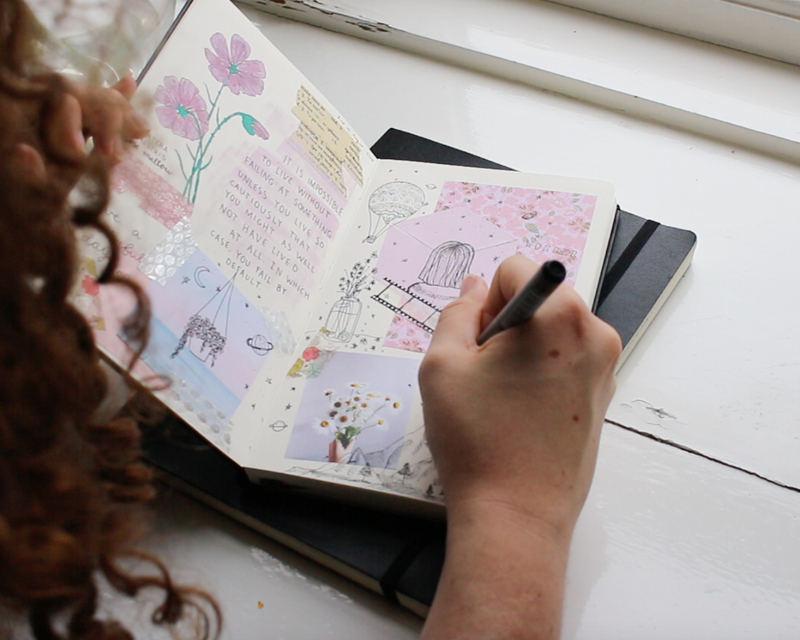 I have written in my diary EVERY DAY since the 19th of April 2012, which amounts to more than 2000 diary entries. It might sound excessive or like a waste of time, but I couldn't have gone without it. Taking those 5-10 minutes at the end of each day to reflect on the events of the day (or the lack of events) is an essential ritual for me, because often I forget to reflect on such things as feeling or things that have happened during the day. Plus, it helps me separate each day from the next. Not every single day can be exciting and adventurous, at least not in my life. Writing about something that has happened 100 times before can be challenging, but it has taught me to notice the little things that set each day apart, whether good or bad. 6. Bullet journal - this particular concept is very well known with entire communities dedicated to it. I have used a bullet journal for an entire year and a half and it has honestly helped me SO much. Having both a calendar, to-do list and creative outlet in one notebook was truly a groundbreaking invention in my eyes. Sadly, I paused my bullet journaling career in order to pursue the almost-as-well-known practise of the Traveller's Notebook. The idea seemed almost too good to be true, and indeed it was. I think I lasted 1,5 months with the TN, and now I'm sort of in a planner limbo. I don't want to crack open a brand-new BJ before New Years, but I also can't find the will to continue my hopelessly neglected TN. If It has any interes,t I used the Leuchturm 1917 A5 notebook with squared pages, but I recommend getting a bullet journal with dotted pages instead. 7. Hobby/interest journal - this may not apply to everyone equally, but most of us have some sort of hobby or interest that we are really passionate about. It could be a music group, a photographer or the art of calligraphy. The possibilities are endless! 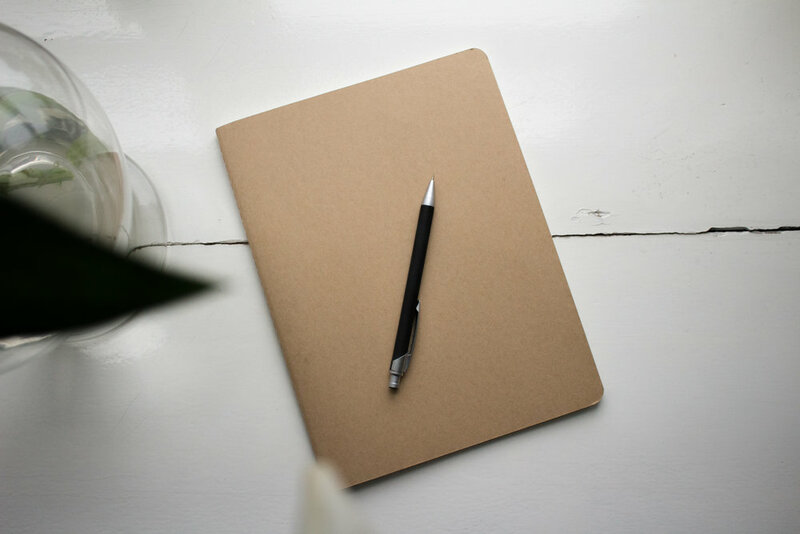 Having a separate notebook dedicated to something is a great place to collect your thoughts and inspiration concerning that thing. Specifically, I love Twenty One Pilots and their music. After having bought their official notebook bundle, I decided to use one of them as a place to jot down my thoughts and ideas specifically regarding their music. 8. School/notes notebook - okay this sounds really obvious, but there it more to it. Living in such a digitalised age, most (or all) of my school notes I make on my computer. Honestly, it is faster and easier and I rarely have the time to make the same notes on paper. But, being the curious person that I am, I love to self-educate. Whenever I'm home and have to much time on my hands, I often watch educational videos online about subjects that actually interest me. Crash Course on Youtube have loads of informative and fun courses from everything to psychology and philosophy to world history and filmmaking. While it is easy to watch these and forget what you learned right away, I get much more out of each lecture by taking notes in hand. Learning does not have to be boring and finding subjects that are interesting can only enrich you. This notebook is from the psychology series (which I definitely recommend!). 9. Tracker - whether it's your financials or fitness goals, having a tracker is a great way to keep yourself accountable. A small notebook where you write down each withdrawal or every workout session will almost certainly keep you on track with your goals. For example, I have a small notebook where I keep track of my savings account. Each time I have some extra cash I make sure to transfer it to my savings and write it down. Seeing the numbers visually is very motivating to me. Also, as it is currently October, I use this little notebook, which I made myself, for all my Inktober drawings. 10. Language journal - most of us will at some point be taught a second or third language. Most often this applies to school situations, whether you are taking Spanish, French or Chinese. Generally, you can have to approaches to being "forced" to learn a new language: Either you can fight your teachers and refuse to learn a new language cause you find classes boring or hard, or you can see it as an opportunity to gain something of real value. Knowing other languages open up so many possibilities. I am currently learning French, my third language. It is SO hard and I really struggle to say anything in school, but because I actually want to learn it, I have take some small steps to implement French into my everyday life. One of them is keeping a small journal, where I force myself to write a few lines of French every day. It doesn't have to be anything fancy, but simply using it on a daily basis will help you immensely in learning a new language. I hope you got some ideas. Come back soon for more posts like this, or check out the Youtube video I made.